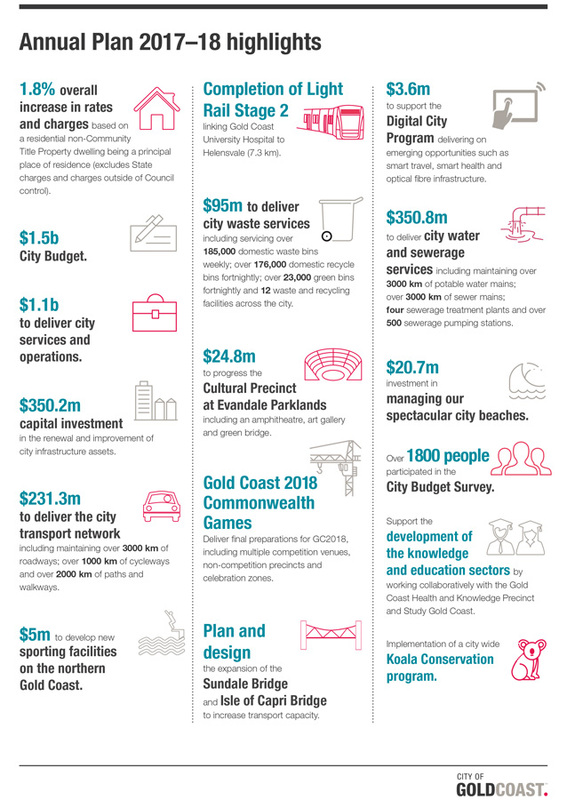 The Annual Plan provides an overview of the budget and plans for the City of Gold Coast for the year ahead as it continues to progress the implementation of the City Vision – “Inspired by lifestyle. Driven by opportunity”; our Corporate Plan (Gold Coast 2022) and key City strategies. It includes the City Budget and City Operational Plan, providing a comprehensive view of the City's priorities, key areas of expenditure and levels of rates, fees and charges. During the life of this plan, the Gold Coast 2018 Commonwealth Games (GC2018), in April 2018 will be the largest international sporting event staged in Australia for a decade. The theme of this Annual Plan “Our Sporting Lifestyle” reflects the city’s love of sport and the GC2018 event itself. The GC2018 and its legacy will increase international recognition of the Gold Coast as a leading sport and recreation destination. Progress against the Annual Plan is presented on a quarterly basis to Council with an annual review published in the City’s Annual Report. More details can be found here >>> The Way Ahead.